With all the physical and mental strain a manga artist expends on their work, it’s no wonder we hear about so many becoming bedridden through exhaustion and illness. After finishing Bleach, Tite Kubo decided to rejoin his fans on Twitter, but this week he decided to use the platform to share a special story. The work a creator puts into their art can mean the world to a fan, but sometimes, the inspiration works both ways. Kubo experienced that first-hand when he fell ill, and began to think he would never be able to reach his series’ final chapter. BLEACH ended 3 months ago. The feeling that there was still something he needed to do, was constantly on his mind. That’s why, firstly, he’d like to use twitter as a platform to say thank you to his readers. The boy wrote that he had decided to immerse himself in the world of manga as a way to enjoy his last days. He read various manga and ended up discovering BLEACH. 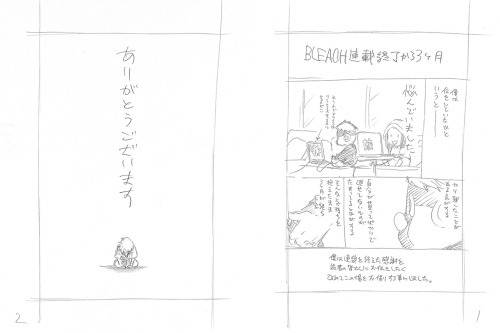 The thought of “wanting to read the next volume of BLEACH” was the first time since his hospitalization that he had thought about “tomorrow”. BLEACH changed his world. BLEACH gave him life again. 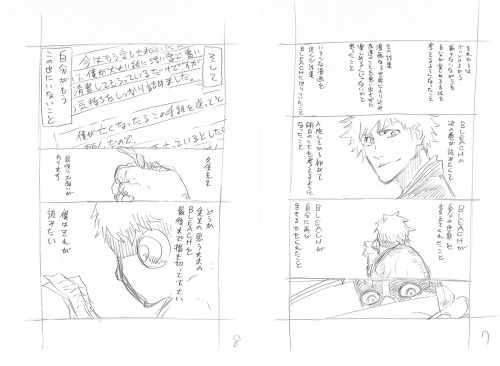 It’s a heartbreaking sentiment, but it speaks volumes that Kubo wanted to share this with all of his fans. It’s a reminder to all of us that one kind action can be the one thing someone needs to carry on. But it’s also a message to any writer or artist, that we must stick with our creations and strive to improve, because we never know who our work will touch. Wow. I didn’t think there was backstory behind all this. This is why I really like these manga writers. This story reminds me of when One Piece creator Eiichiro Oda told the ending of One Piece to a dying child. In the end, the child said that the ending was beautiful. Tite Kubo really cares about his fans. I will appreciate his ending and I won’t complain. That’s a sweet story in itself, I didn’t know Oda had done that for a fan. I bet it is a beautiful ending, it’ll be so sad when One Piece ends though. It is sweet. I think I made a post and a link if you want to read the full scope. I think manga authors like them are really amazing. I find them better than most celebrities here. Awwwww I just found the story on your blog and it’s so adorable. Whenever you see Oda he looks so cheerful, it’s heartbreaking to imagine him trying not to cry in front of that poor little kid. Mangaka have a special feeling about them because of their incredible drive to put literally all their energy into a single project like so many of them do. It takes a special kind of person I think, even when you’re talking about a country with Japan’s work ethic. Aww! Good thing about that is your eyes were too full of tears to see any strange looks from your coworkers. I was sitting in the break room when I read this. Had to retreat to my work desk so I wouldn’t be seen crying. Thank you for sharing this touching story. Wow….pretty much at a loss for words when I read a post such as this. What a truly heartwarming, but also heartbreaking story. I totally agree with the comment from Heyitszel : It truly brings a tear to my eye. Amazing and truly inspiring story. Thanks for sharing this. I know, it’s terribly sad. But I would like to think he’s happy somewhere, knowing Kubo did finish Bleach in the end. It’s such a sad story… Both his and the boy who sent that letter. I can only imagine how much emotion went through Kubo as he read it. To think that his work could mean so much to someone, and how much joy and heartbreak he felt knowing it. I love Bleach, even if I haven’t read it in a while (therefore I don’t know the ending). But I’ve read about how people seemed dissatisfied with it. Ultimately, it was his manga, his baby, and he should be able to finish it any way he wants to. His fans should respect that, even if it goes against their own wishes. It would be impossible to please everyone. It’s a feat just to finish a long-running manga when you’ve poured whole days of work into it for so many years. I’m glad Kubo could see how much light it could bring to people’s lives, and he absolutely deserved to end it how he envisioned it.